Product prices and availability are accurate as of 2019-04-19 05:59:44 EDT and are subject to change. Any price and availability information displayed on http://www.amazon.com/ at the time of purchase will apply to the purchase of this product. HP 61XL Black Ink Cartridge Black (CH563WN) for HP Deskjet 1000 1010 1012 1050 1051 1055 1056 1510 1512 1514 1051 2050 2510 2512 2514 2540 2541. HP 61 ink cartridges work with: HP Deskjet 1000, 1010, 1012, 1050, 1051, 1055, 1056, 1510, 1512, 1514, 1051, 2050, 2510, 2512, 2514, 2540, 2541, 2542, 2543 2544, 2546, 2547, 3000, 3050, 3051, 3052, 3054, 3056, 3510, 3511, 3512 HP ENVY 4500, 4502, 4504, 5530, 5531, 5532, 5534, 5535. HP Officejet 2620, 2621, 4630, 4632. 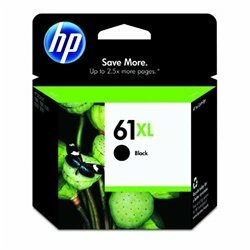 HP 61 XL ink cartridge yield (approx. ): 480 pages. Get up to 2x the pages with Original HP XL ink cartridges compared to standard cartridges. Original HP ink cartridges: genuine ink for your HP printer. Ensure that your printing is right the first time and every time with HP printer ink: 61 ink. CHOOSE AN INK REPLENISHMENT SERVICE - Let your printer track usage and have ink delivered before you run out. Either reorder HP Genuine ink cartridges only when you need them through Amazon Dash Replenishment, or save up to 50% by paying for pages printed through HP Instant Ink. What's in the box: 1 New Original HP 61XL ink cartridge (CH563WN). Color: Black.